SternMaid, Wittenburg, Germany, has upgraded its contract manufacturing facilities with the addition of a new powder blender. At the end of 2018 the company commissioned a new blending line with an operational capacity of 3000 litres. The line was installed in the newly built Plant 2 in Wittenburg, which offers more efficient processing. 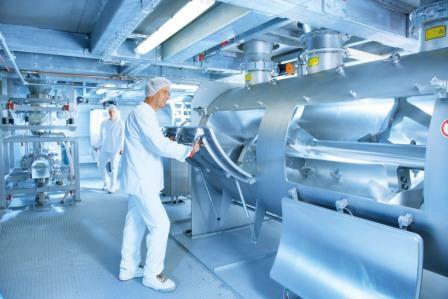 The plant is designed for the gentle production of foods and food supplements in powder form such as meal replacers, dietetic products, dry beverage bases or protein mixtures and is equipped with an automatic wash-in-place (WIP) system. This investment will enable SternMaid to increase its production capacity by about 10,000t/year. With the new blending line, SternMaid will in future be able to produce the mixtures needed for filling into customised retail packs such as spiral-wound plastic or fibreboard cans, bags or sachets directly in Plant 2. Since these small-pack lines are in the same building, this will improve workflows within the plant. As a further option, liquid ingredients can be incorporated into the mixtures homogeneously in proportions of between 0.01 and 60% of the formulation with the aid of special nozzles. To enable intensive mixing, the machine is also fitted with cutters.